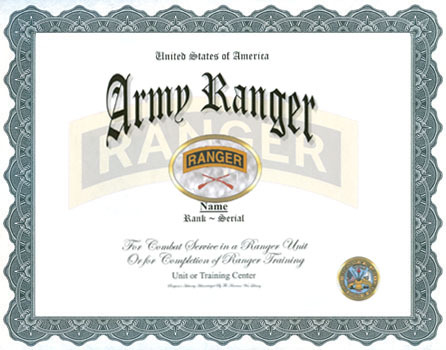 A photocopy of your WD AGO 53-55, DD-214 or ERB/ORB displaying your Ranger qualification. I. DESCRIPTION: 1. Description: The full color tab is 2 3/8 inches (6.03 cm) long, 11/16 inch (1.75 cm) wide, with a 1/8 inch (.32 cm) yellow border and the word "RANGER" inscribed in yellow letters 5/16 inch (.79 cm) high. The subdued tab is identical, except the background is olive drab and the word "RANGER" is in black letters. 2. Award Eligibility: Awarded to U.S. military and civilian personnel, and foreign military personnel who qualify as prescribed. The basic eligibility criteria for award of the tab is as follows: (1) Successful completion of a Ranger course conducted by the U.S. Army Infantry School. (2) Any person who was awarded the Combat Infantryman Badge while serving during World War II as a member of a Ranger Battalion (1st-6th inclusive) or in the 5307th Composite Unit (Provisional) (Merrill's Marauders). (3) Any person who successfully completed a Ranger course conducted by the Ranger Training Command at Fort Benning, Georgia. The Commandant of the U.S. Army Infantry School, Commanding General of the U.S. Army Human Resources Command and the Commanding General of the Army Reserve Personnel Command may award the Ranger Tab. 3. Date Approved: The Ranger Tab was approved by the Chief of Staff, Army, on 30 October 1950. 4. Metal Tab: The Ranger Tab metal replica is available in two sizes, full and dress miniature. Soldiers authorized to wear the Ranger Tab may wear the Ranger Tab metal replica. The full size version is approximately 1 5/32 inches (2.94 cm) in width. The dress miniature version is 13/16 inch (2.06 cm) in width. 5. Wear Policy: The full color tab is worn 1/2 inch below the shoulder seam on the left sleeve of the Army green coat. The subdued tab is worn 1/2 inch below the shoulder seam on the left sleeve of utility uniforms, field jackets and the desert battle dress uniform (DBDU). 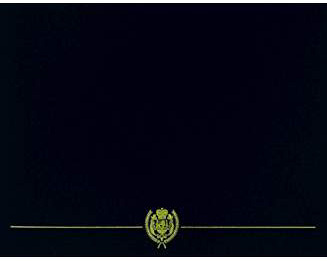 The full size metal tab is worn only on the blue and white dress uniforms and the AG shade uniforms. The dress miniature metal tab is worn on the blue and white mess and evening mess uniforms. When miniature medals are worn on the blue and white dress uniforms, personnel may wear the dress miniature Ranger tab metal replica.